Unearthing the Green Revolution, Part I: California’s fertile Central Valley is home to a sizable community of farmers from Punjab in India, a region also famous for its rich cropland. Why they came to the United States is a story as layered and complex as the politics and science of the crops they cultivate. To find an almond, you have to crack open the layers that conceal it. You have to get through the green, leathery exterior shell to the rough, brown, interior shell deep in the center. There, you’ll discover the small sweet white nut – something to chew on, like a kernel of truth waiting to be found. Sandeep Singh is cracking open almonds on his 70-acre farm in Tracy, California. He picks one off a tree to show me the inside. “While the nut is on the tree it’s called a shell,” he says. California produces four fifths of the world’s almonds. Almonds are a $5 billion industry for the state. And Singh is now a small part of it. He marvels at how tall his trees will eventually be. He says they’ll grow up to three times their current height, and they’re already 12 feet tall. Taller trees mean a lot more almonds, which is good for business. But it isn’t easy money. 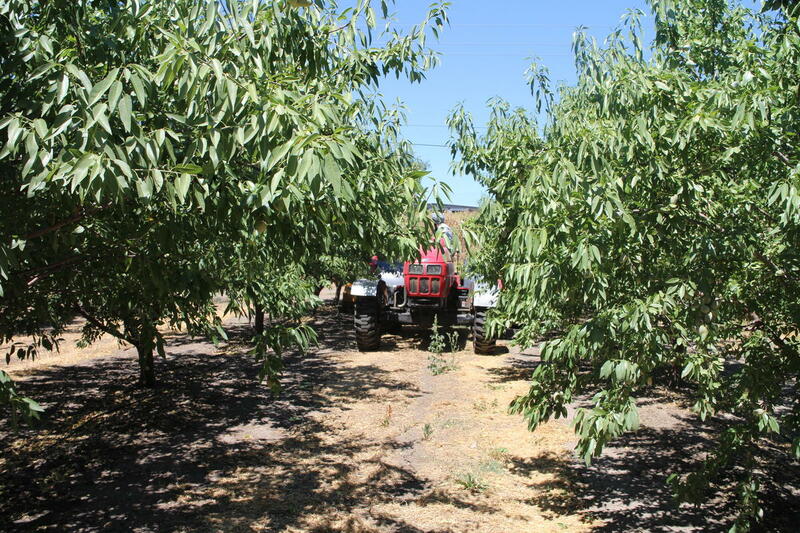 Almond farming is costly, and it’s hard work. Sandeep Singh’s almond trees in Tracy, California. Singh came to the United States from the state of Punjab in northern India when he was 19 years old. He sought economic opportunities and chose not to go to college, but to work instead. He took a job as a construction worker, then as a taxi driver in New York, and then as a truck driver in California. But three years ago, he decided to return to his agricultural roots. Singh may be a young farmer in California, but he comes from a family that’s been farming for generations. His father was a farmer, his grandfather was a farmer, his great grandfather was a farmer, on and on, as far back as he can go. Actually, his family is still farming today, on their ancestral land in the state of Punjab, in northern India. So, why did he come to California to farm when he could have just farmed where he grew up? To answer that, we’ll go to Punjab, to the small village where he was born. I’m standing in the village of Bhairomuna, near the city of Ludhiana, in Punjab, India. Singh’s ancestors came and settled in this village about 300 years ago. They’ve been farming ever since. 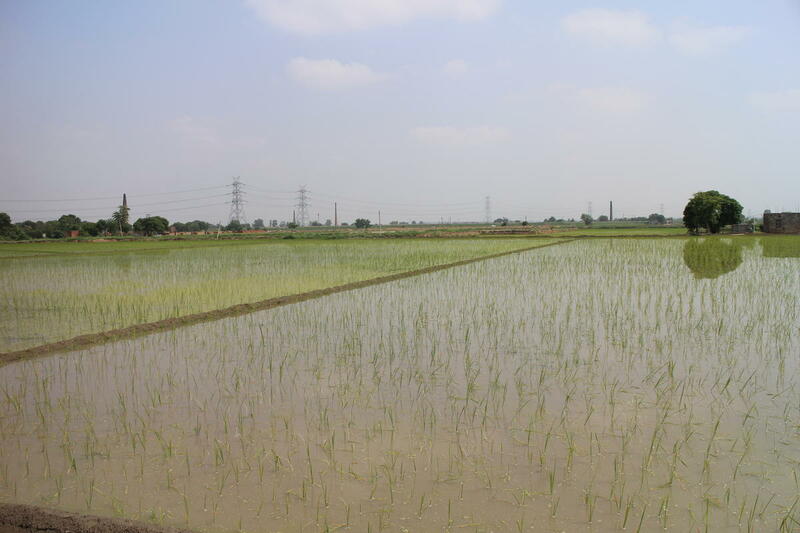 Today, on their 17 acres of land, they grow rice and wheat, like most farmers in Punjab. But Balvir Singh, Sandeep’s father, says they’ve been struggling to make ends meet. He says that’s partly because of how expensive farming has become in the last half-century. It wasn’t always that way. Fifty years ago, that’s how irrigation used to happen in Punjab. With water wheels attached to wells, pulled round and round by oxen. Today, most farmers in Punjab use tubewells — long pipes that bore down into aquifers deep underground and pump the water up, supplying it through pipes to the farmland. Sandeep’s brother, Virinder Singh, shows me the tubewell on their farm. He opens the door to a dark room filled with switches used to operate the tubewell. When his family installed it back in 1965, the water was 15 feet below the ground. Now, he says, they have to drill down 200 feet to get their water. And the water levels are continuing to recede. But how can water disappear in Punjab? The soil-rich state is full of rivers. It’s actually named for the five rivers that flow through it, and is historically known as one of the most fertile regions on earth. Sixty percent of Punjabis work in agriculture. And their small state provides much of the food for one of the largest nations on the planet. Water-intensive rice fields in Punjab. Virinder Singh and I take a walk on their family’s farmland. All around me, rice plants sit in fields flooded with water for miles and miles. He tells me they will sit like this for almost five months, using water 24 hours a day. But Balvir Singh remembers a time when they didn’t grow rice at all. Things started to change in 1965. That year, they had their first tubewell installed, and it was the year the first high yielding varieties of rice were introduced to Punjab. The seeds of the Green Revolution were planted. To understand the Green Revolution, we must go back to the years immediately after World War II. The U.S. had stockpiles of chemicals, tanks and other equipment left over from the war. The chemicals were turned into pesticides and fertilizers. The tanks were turned into tractors. The government and banks gave out loans to farmers to buy this equipment and increase production. In 1944, the Rockefeller foundation funded the scientist Norman Borlaug to go to Mexico, where he developed high-yielding varieties of wheat, called “miracle wheat.” Around the same time, the corporations that produced agricultural equipment were trying to expand. Gimenez says this is how the Green Revolution began. “The Green Revolution was a campaign to export not just the products but the form of agricultural production to the Third World,” he says. Punjab was flooded with high-yielding seeds, chemical fertilizers, pesticides, herbicides, advanced farming equipment, and scientists trained by U.S. universities. As food production grew Borlaug was hailed as the scientist who would end world hunger. He was awarded the Nobel Peace Prize in 1970. Whole nations bought into Norman Borlaug’s ideas. Balvir Singh remembers when India invested in the miracle wheat the scientist had helped invent, and which the Indian government bought by the ton in 1966. I ask him if it actually helped produce more wheat. He says it did for a while, but today, it doesn’t really make a difference. “The cost of production has increased so much but the price of our crops hasn’t,” he says. Miracles can have consequences. More food means more dependence on water, chemical fertilizers and pesticides that lose their effectiveness over time. As a result, Balvir Singh says, most farmers in his village became indebted. Today that debt continues to grow. That’s more than $30,000. And this in a state where the average annual income is about $1,000 per person. Balvir Singh says the land has become dependent on pesticides, even as debt and high production costs reduce the value of crops grown there. He felt the effects of this acutely in his potato crop. The Ludhiana district, where the Singh family lives, received lots of attention during the Green Revolution. Fifty years ago, it was thought to be one of the areas with the most potential for success. But now, people want to leave. I ask Balvir Singh if he wants the rest of his family to leave and join his son, Sandeep, in Modesto. Almost 10,000 miles away, Sandeep Singh tends to his farm in California’s Central Valley. He sends money home to his family regularly. He even helped them build the house they live in now. He says his peers who left Punjab are doing well. “If you go down south to Fresno or Bakersfield, you see every other farm is owned by Punjabis,” he says. Farmers like Sandeep Singh have left the country where the Green Revolution was carried out. They’ve come here, instead, to the country that created it. And more are coming, because, Singh says, those left in Punjab aren’t doing so well. This may be one result of the Green Revolution that its founders never expected.